The dream of owning a brick and mortar business quickly became a reality after we purchased a home in Alto, NM and found a building to lease in beautiful Ruidoso, NM. After a month of renovations (painting, carpeting, etc.) we opened in mid-December. Our GRAND OPENING was January 19th, 2017! 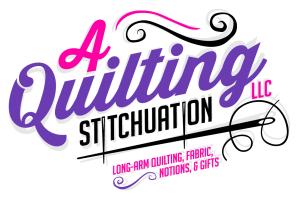 What is "A Quilting Stitchuation, LLC?" It is a place for creativity, fun, and knowledge to be shared with others who appreciate the love, time and warmth that goes into every stitch. Life is too short to not love what you do and do what you love. We fell in love with fabric, quilting, and the great people we met along the way. This business offers fabric, notions, gifts and long arm quilting services, as well as classes, but most of all it's a gathering place for friends to spend time together.